If you're going on holiday this summer and want to make a statement with your luggage, then Globe-Trotter's new Riviera Collection could be just the ticket. Featuring pastel shades of pink, lemon and blue, as well as summery stripes, this collection instantly brings sun loungers, parasols and ice cream to mind, which makes packing one of these if the perfect way to start a getaway. When it came to putting together a mood board for the collection, the Globe-Trotter design team were inspired by Hollywood in the 1950s and 60s, as well as The Talented Mr Ripley, with its sun-drenched, sumptuous setting along Italy’s Amalfi coast. The new stripes motif in retro pastel shades has been screen-printed onto the fibreboard by an independent company located close to Globe-Trotter’s Hertfordshire headquarters. 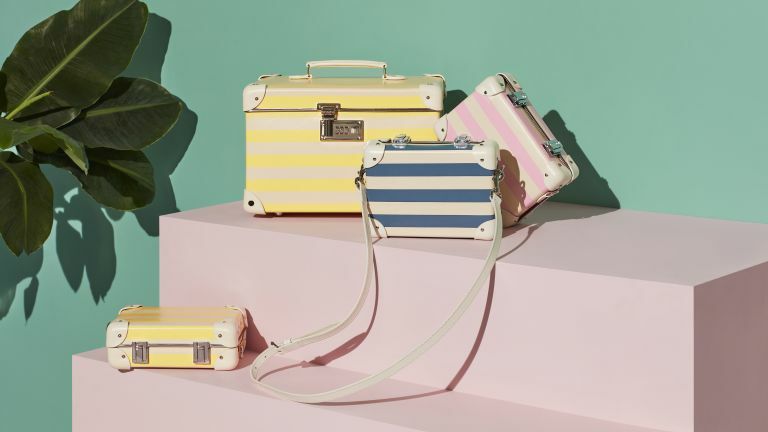 And, as well as being printed on the signature suitcases, the stripes also make an appearance on the new cross-body bag and a brand-new line of detachable shoulder straps, which can be fitted to other Globe-Trotter cases. The collection is made up of Globe-Trotter's signature suitcase and vanity cases, while complementary leather bags and accessories complete the look. The year also sees the launch of a new statement 'Miniature Case', which imitates the iconic Globe-Trotter suitcase design on a much smaller scale. Another new addition to the Globe-Trotter family is a selection of beautifully made stickers. The designs depict four iconic locations: Paris, London, Hawaii and Los Angeles, and are like ‘modern versions of the old travel stickers,’ Charlotte Seddon, Globe-Trotter’s senior designer, explains. This is the start of a new core collection for Globe-Trotter, with new designs and cities coming soon. You can check out the full collection on Globe-Trotter's website.